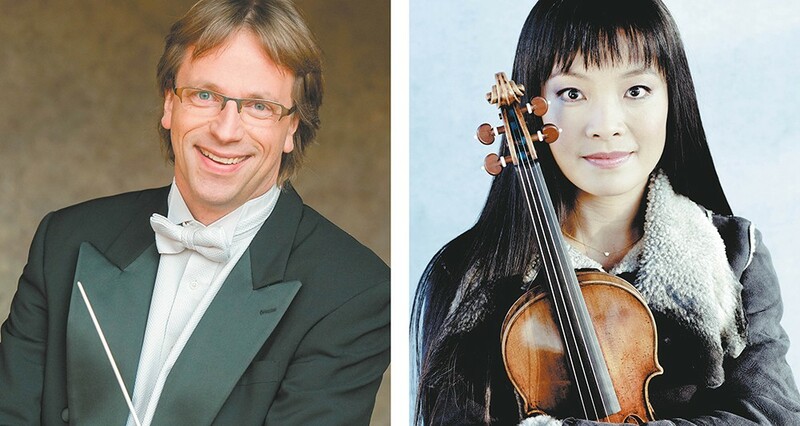 Eckart Preu and Mira Wang join up to deliver a challenging U.S. premiere with the Spokane Symphony this weekend. Eckart Preu knows that classical music audiences, including those in Spokane, require a steady diet of, well, classics. But the Spokane Symphony's music director also knows that the only way to keep orchestral music a viable, living thing is to support modern composers and their work. "I've had really good experiences with this audience where I feel I've programmed quite a lot of living composers over these past years," Preu says. "Slowly, slowly. There's a lot of European music that's really out there, and you have to really watch out and choose it wisely. "You have to give them the meat and potatoes, but if there's a little kimchi on the side, that's OK, too." This weekend might be the spiciest bit of "kimchi" Preu has served up in his decade-plus in the Lilac City. The symphony's Classics 5: Scheherazade show sandwiches the U.S. premiere of German genre-pushing composer Torsten Rasch's Tropoi violin concerto between some Bach and Rimsky-Korsakov's Arabian Nights-inspired piece that provided the concert its name. Preu and Rasch were students together in the Dresden Boys Choir, and Preu says Rasch is one of the few musicians from the school who went on to a successful career as a composer. Rasch has done everything from movie scores in Japan to operatic heavy-metal shows with German rock stars Rammstein to collaborations with British synth-pop pioneers Pet Shop Boys on a silent-film soundtrack. "He's very open to all these collaborations, and I think that influences his own work," Preu says of his old schoolmate. "What is striking about his music is it just really blows you away. It's just overwhelming, the sound. He uses a big orchestra, and this is a concerto, where mostly you have a solo instrument and you try to keep the orchestra out of the way and let the soloist shine. ... This is a different ballgame. It's virtuoso music for all the instruments. It's actually concerto music for all the instruments, with just the violin being the main person." The Spokane Symphony joined the Dresden Philharmonic and South Carolina Philharmonic in commissioning the work from Rasch, and it was performed in Germany in 2016; the Spokane shows will be the first time American audiences will hear the piece. Preu says commissioning original works is always a gamble because you never know exactly what you're going to get in return, but it's important to do because you're "helping define how the future of music is going to go" by identifying composers you think are important and giving them an opportunity to push themselves. "You go for some risks," Preu says, and with Tropoi, he received a piece that's "just big, with everyone playing something different at the same time. It's literally 20 different instruments playing different things at the same time." Preu knew he'd need a soloist of serious skill to stand out among Rasch's epic soundscapes, so he tapped Chinese violinst Mira Wang, a musician he worked with years ago when he was resident conductor of the American Symphony Orchestra in New York. That group was known for tackling "big unknown pieces that nobody ever performs," Preu says, and Wang was able to come in and play some of the "difficult, unknown stuff." "For a piece like [Tropoi], where you fight as a single violin against a 90-piece orchestra, you need a certain personality and not only the skills but the personality and energy to cut through. To compete, basically," Preu says. In an email from China, Wang explained that she's played on some of Rasch's previous chamber music works, and added that "it is always exciting to premiere a new piece. It gives you so much pleasure to bring music of our generation to the audiences." Wang has been an in-demand instrumentalist since she was one of 150 children out of 30,000 candidates chosen to study at the Central Conservatory of Music in Beijing. Most recently her and her husband Jan Vogler have toured as part of Bill Murray's "New Worlds" group that blends music and the actor reading literature passages. While Wang dubs that experience "very exciting," taking on Tropoi is, too. The piece, Wang writes, "offers many melodic singing lines and some very exciting fast passages. Of course, one needs to know that it is the music language of our time. That language is definitely different from the classical or Romantic period." The original print version of this article was headlined "Spicing It Up"